The periodontium is the tissue that surrounds and supports the teeth, and periodontists are specialists in dealing with this area. Unlike a hygienist, a periodontal specialist can diagnose and treat gum diseases, where as a hygienist is there to implement treatment. A specialist periodontist is able to diagnose gum diseases by x-ray, visual analysis and probing the gum around the infected area. Periodontitis (a set of inflammatory diseases affecting the periodontium) itself can refer to a number of inflammatory diseases which, if left unchecked, can lead to the loss of the bone around the teeth and thereafter to the loosening and ultimately the loss altogether of the teeth themselves. The symptoms of periodontitis include red, swollen or bleeding gums, halitosis, a recurring metallic taste in the mouth, receding gums, loose teeth and gaps between the teeth caused by the collagen in the gums breaking down. 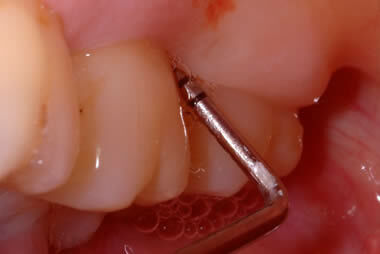 Many people assume that the painless occurrence of these symptoms is nothing to worry about. In fact, it’s a very good idea to check with a periodontist if any of these symptoms persist. Periodontitis is linked to inflammation of the body, increased risk of stroke, myocardial infarction and atherosclerosis, as well as impaired memory and mental capacity in people over 60 years of age, so it is particularly important to check it in its early stages. There is also evidence linking it to the health of new born babies. In your daily life, you can help prevent periodontitis with proper brushing, flossing, regular check-ups, and using the recommended oral hygiene aids. If you suspect the disease may be advanced you should seek a consultation with a specialist periodontist. We have two specialist Periodontists who will be able to give you a thorough periodontal exam. They can then work with you to help control and/or prevent the disease process, by working on a tailored treatment plan designed just for you. Our specialist periodontists based in Chelmsford, Essex are trained to spot gum disease at an early stage and then provide a comprehensive treatment plan. Working in conjunction with our team of dental hygienists, our periodontist will identify the symptoms and then treat the underlying causes of the gum disease that, if left unchecked can ultimately lead to the loss of teeth. The specialist gum disease dentist at Blue Sky helped me overcome some fairly serious problems for which I will always be grateful.